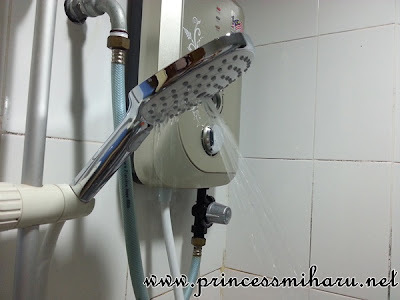 People asked me, "What do you blog?" or "What blogger are you?" I would always say I am a lifestyle blogger. Fashion, food and traveling is a must, but what about your showering pleasure? Ahha! You never thought of that, don't you? 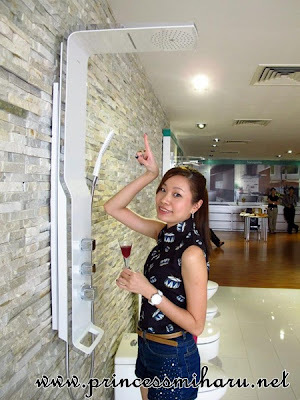 To be a 'holistic' lifestyle blogger, I have attended the bathroom fitting by Hansgrohe Malaysia on a beautiful Saturday morning. The Perfection of Shower Pleasure , accompanied by custom made cupcakes that spelled the brand out. The Raindance Rainfall Lift shower panel on the wall. 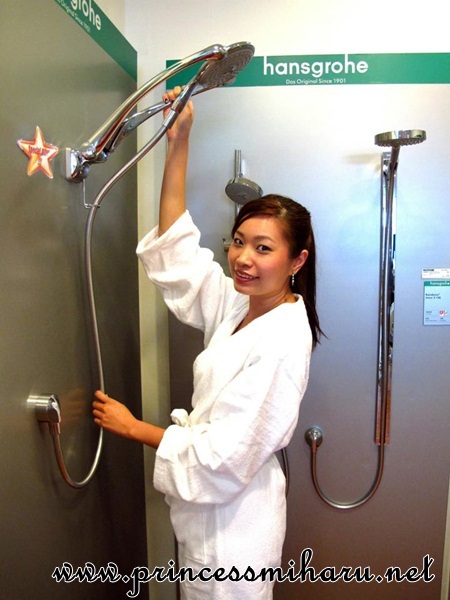 Very slender and is one of the flattest shower panels available. The handle at the lower end of the panel can be used to smoothly slide the complete Raindance Rainfall Lift up or down by up to 200 millimeters.Compare the #2 photo with #3 and you can see the difference. 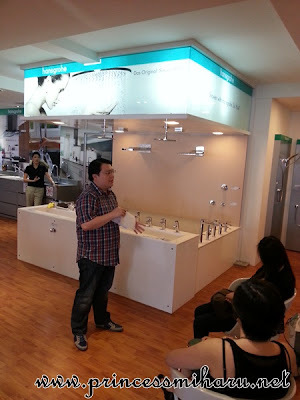 Mr. Darren Quek from the Business Development of Hansgrohe Malaysia gave his speech and also brief introduction about the Hansgrohe Raindance Rainfall shower system. After the speech, I went to change into bathrobes and bathroom slippers. 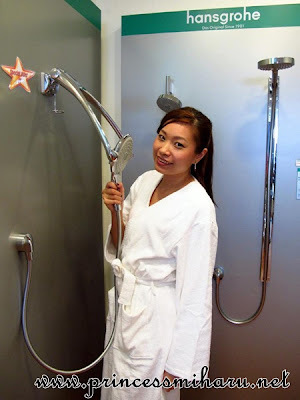 While waiting for my turn to experience the 'Raindance Select' Shower Heaven, me & Timmy went around to check out all the shower heads and mixers. And just nice on the chest. 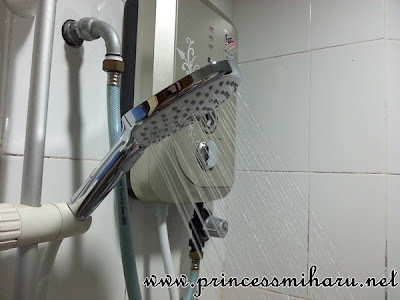 Different shower heads and this little green thing caught my attention!!! 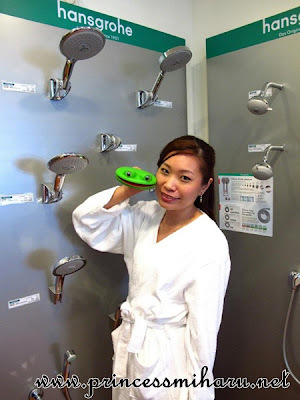 Croak croak croak, little froggy shower head on my head!!! So many different type of water taps!!! Still can't leave this Balinese bath tub! 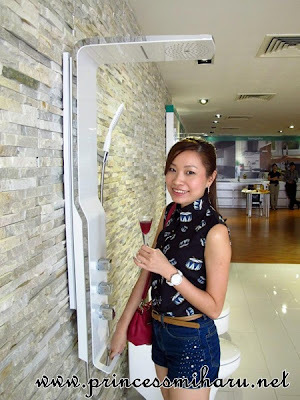 Very considerate Hansgrohe Malaysia has provided us with the foot massage to soothe our weary limbs while waiting for my shower experience. Timmy and me during food massage. Look carefully on Timmy's expression! LOL! I was enjoying the foot massage. But definitely not Timmy!!! LOL LOL!!! Look at his miserable expression! Hahahaha! 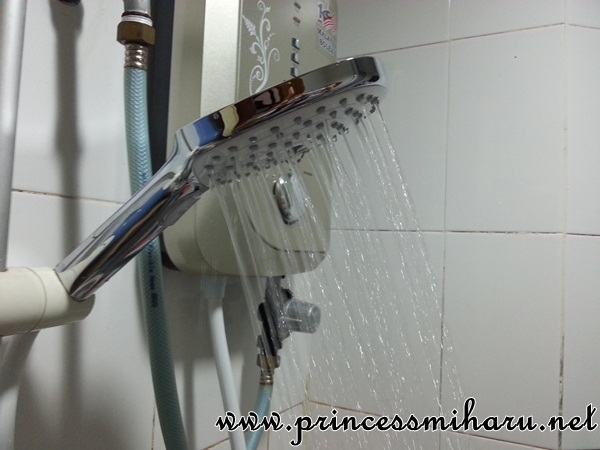 The shower experience was a great and awesome one!! Eventually I got to try out 2 different type of the shower system. 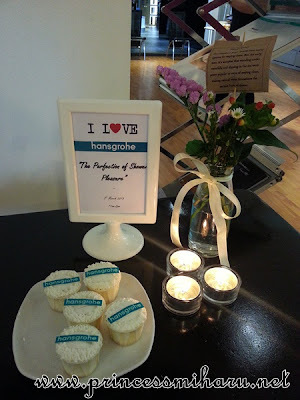 I really enjoyed the luxury that Hansgrohe brought to us! 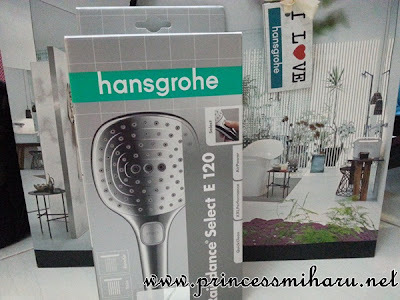 Thanks to Hansgrohe Malaysia, I was given a Hansgrohe Raindance Select E120 to continue enjoy my shower at home!! 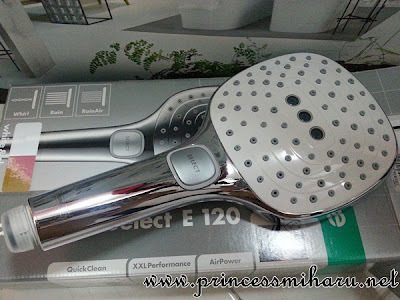 At a touch of a button, we get to choose among three shower experiences. Courtesy of Hansgrohe Malaysia to reward my blog readers, just present this voucher and you are entitled for a 40% off on all Hansgrohe products. 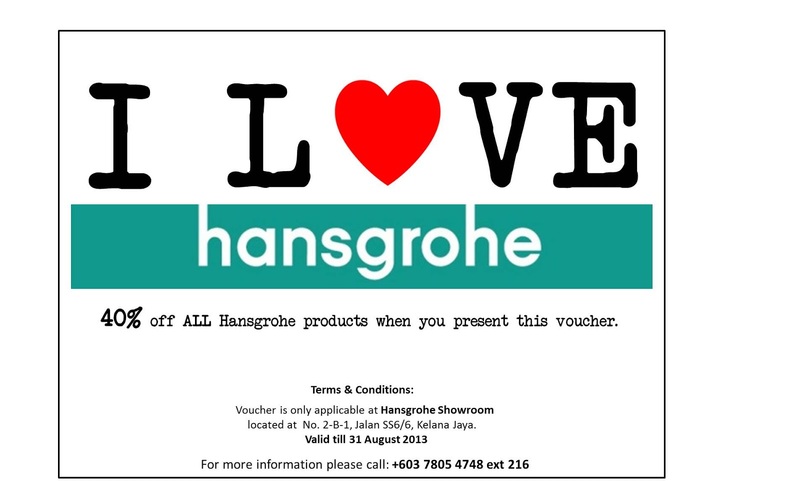 I suggest you to print out, or show my blog post with this voucher to the retail staffs. Wait no more!! Hurry up and visit Hansgrohe Malaysia now!!! No. 2-B-1, Jalan SS6/6, Kelana Jaya.